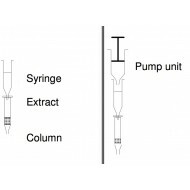 Vitamin B12 Immunoaffinity Column 10 columns per kit The Vitamin B12 Immunoaffinity Column (IAC) is a helpful tool in specific isolation and enrichment of vitamin B12 from different matrices. 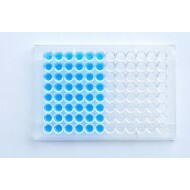 After the IAC procedure the eluate can be quantitatively analyzed by various analytical technique..
Vitamin H (biotin) ELISA Kit 96 well ELISA microplate Incubation time: 1 h 20 min Range: 1 - 25 ng/mL Sensitivity: 0.5 ng/mL Sample size: 100 µl Sample type: Food Substrate: TMB 450nm ..
Vitamin H (biotin) Immunoaffinity Column 10 columns per kit The Vitamin H Immunoaffinity Column (IAC) is a helpful tool in specific isolation and enrichment of vitamin H (biotin) from different matrices. After the IAC procedure the eluate can be quantitatively analyzed by various analytical te..
VMA ELISA kit 96 well ELISA microplate Incubation time: 1 h 25 min Range: 0.06 - 8 µg/ml Sensitivity: 35 ng/ml Sample size: 1 ml Sample type: Urine Substrate: TMB 450 nm ..
Walnut ELISA Kit 96 well ELISA microplate Incubation time: 60 min Range: 2 - 60 ppm Sensitivity: 0.35 ppm Sample size: 100 µl Sample type: Food Substrate: TMB 450nm ..
Yersinia enterocolitica ELISA IgA kit 96 well ELISA microplate Incubation time: 1h 50 min Range: 1 - 200 IU/ml Sensitivity: 1.02 IU/ml Sample size: 5 µl Sample type: Serum, plasma Substrate: TMB 450nm ..
Yersinia enterocolitica ELISA IgG kit 96 well ELISA microplate Incubation time: 1h 50 min Range: 1 - 180 IU/ml Sensitivity: 1.92 IU/ml Sample size: 5 µl Sample type: Serum, plasma Substrate: TMB 450nm ..
Yersinia enterocolitica ELISA IgM kit 96 well ELISA microplate Incubation time: 1h 50 min Range: 1 - 110 IU/ml Sensitivity: 1.02 IU/ml Sample size: 5 µl Sample type: Serum, plasma Substrate: TMB 450nm ..
Zearalenone Mycotoxin (RAL/F-2) ELISA Kit 96 well ELISA microplate Incubation time: 20 min Range: 10 - 500 ppb Sensitivity: 5 ppb Sample size: 100 µl Sample type: Food, cerals, beer, gyle Substrate: TMB 450nm ..
Zearalenone Immunoaffinity Column 10 columns per kit The Zearalenone Immunoaffinity Column (IAC) is a helpful tool in specific isolation and enrichment of zearalenone also known as RAL or F-2 mycotoxin from different matrices. After the IAC procedure the eluate can be quantitatively analy..
ZnT8 Antibody ELISA Kit The ZnT8 autoantibody (ZnT8 Ab) ELISA kit is intended for the quantitative determination of ZnT8 Ab in human serum. Autoantibodies such as ZnT8 to pancreatic beta cell antigens are important serological markers of type 1 diabetes mellitus. The antigens recognis..
Zona Pellucida Antibody Ig-Classifying ELISA kit 96 well ELISA microplate Incubation time: 2h 30 min Range: Cut-off Sensitivity: N/A Sample size: 5 µl Sample type: Serum, plasma Substrate: TMB 450nm ..